The Tashi books are written by Anna Fienberg and her mother, Barbara Fienberg. They are illustrated by Kim Gamble. Listen to Anna Fienberg read a section from Tashi and the Golem as Kim Gamble draws a scene from the book. Watch Kim Gamble talk about how he creates a scene for Tashi and the Golem. Anna is a talented storyteller who loves to write stories about fantastic and magical things. She grew up in a house filled with books. Barbara was a teacher librarian who relished stories as much as chocolates. 'On Sunday mornings we'd all lie in bed with our books, lost in magical wardrobes, witches’ spells, genies’ magic … What we were going to read next was just as important in our family as what was for lunch!' says Anna. Kim is one of Australia's leading illustrators for children. 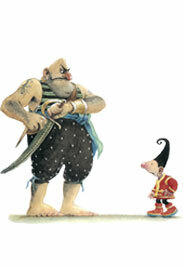 He was born in Sydney and worked in a variety of occupations before beginning to illustrate stories for children. His first assignment was for the School Magazine. It was there he met Anna Fienberg. In the first book about Tashi, Kim drew an angry War Lord who was after Tashi, and also a lonely dragon. Since then Kim has created many fabulous creatures and characters for the Tashi series: giants, bandits, the Wicked Baron, ghosts, white tigers, the Genie, Baba Yaga, demons, Wise-as-an-Owl, river pirates, Luk Ahed, Uncle Tiki Pu, brigands, robbers, Blackheart, Bluebeard, the Mixed-up Monster, the Phoenix, and the Golem. Anna and Kim have worked together for many years, not only on Tashi but also on the Minton series, and picture books: Joseph, There Once Was a Boy Called Tashi and The Amazing Tashi Activity Book.